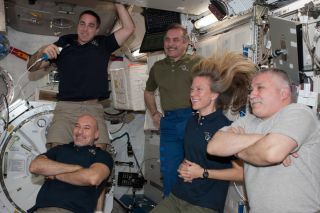 Five of the six Expedition 36 crew members are pictured in the International Space Station's Kibo laboratory during a daily planning conference. Pictured from bottom left are European Space Agency astronaut Luca Parmitano, NASA astronaut Chris Cassidy, both flight engineers; Russian cosmonaut Pavel Vinogradov, commander; NASA astronaut Karen Nyberg and Russian cosmonaut Fyodor Yurchikhin, both flight engineers. Photo released Aug. 23, 2013. Americans across the United States will pause to celebrate the Labor Day holiday on Monday (Sept. 2), even space travelers soaring high above Earth aboard the International Space Station. There are two American astronauts — NASA's Karen Nyberg and Chris Cassidy — currently serving on the space station's six-person crew, and they are expecting a light work day Monday, NASA officials said. While station astronauts typically take a break from their usual duties on holidays, they still may need to do a little work. Nyberg and European Space Agency astronaut Luca Parmitano might take part in a quick training session to prepare for the arrival of an unmanned cargo-carrying Cygnus spacecraft, NASA spokesman Josh Byerly told SPACE.com via email. The Cygnus capsule is scheduled to launch from NASA's Wallops Flight Facility on Wallops Island, Va., atop an Antares rocket on Sept. 17. It will mark the first Cygnus test flight to International Space Station. The unmanned cargo ship was built by the commercial spaceflight company Orbital Sciences Corp. But aside from Cygnus training, Nyberg and the rest of the station's Expedition 36 crew will likely have the chance to chat with their loved ones in honor of the U.S. holiday. Space station residents can call their families whenever they have time and they can send emails and video link with the ground. This year's Labor Day in space should be more subdued than last year's holiday. In 2012, astronauts on the space station were prepping for an extra spacewalk after a sticky bolt prevented NASA astronaut Sunita Williams and Japanese spaceflyer Akihiko Hoshide from replacing a faulty piece of hardware on the outside of the station. The $100 billion International Space Station is currently home to multicultural crew representing the United States, Russia and Europe. The Expedition 36 crew includes Nyberg and Cassidy (both of NASA), Italian astronaut Luca Parmitano and Russian cosmonauts Pavel Vinogradov, Fyodor Yurchikhin and Alexander Misurkin. The station is about the size of a five bedroom house has the wingspan of a football field. Construction of the station began in 1998 and it has been continuously staffed with crews of spaceflyers since 2000.